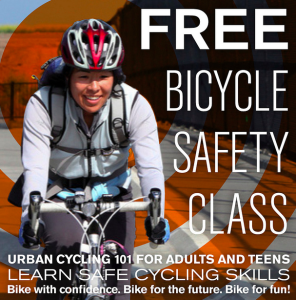 Learn to bike safely and confidently with this FREE class! Learn basic rules of the road, how to share the road with cars on busy streets, how to equip your bicycle, lock your bike, fit your helmet, and avoid crashes by riding predictably, visibly, and communicating with other road users by your actions and signals. Every workshop has the same content so you only need to attend once. For adults and teens, no bike needed. Please note: All of Bike East Bay’s UC Berkeley classes are open to the public, but are also part of the BEST (Bicycle Education & Safety Training) program allowing ticketed cyclists to have their fines reduced. Class is FREE but please register here.